Firstly, let’s start with the ludicrous schedule: yes, we know football over Christmas is tradition and so forth, but playing twice in 48 hours is crazy. Players need three rest days between games. Playing with less than that puts the players at risk of injuries and with fatigued players, games are often of a lower quality and tempo. This means that freshening up the side is a good idea. Hiddink brought Mikel in for the ill Fabregas and Zouma replaced Cahill, who had a foot injury. Up front, Remy was out injured despite being an unused sub just two days earlier. By the 93rd minute here, Hiddink had used just three of six subs available to him over his two games in charge: a clear sign he doesn’t think much of his squad or bench options. Mourinho was criticised constantly for not using Baba Rahman or Ruben Loftus-Cheek more often but it seems Hiddink doesn’t even trust Ramires – a player whose energy may have proved useful in an away game with a counter attacking plan. With an unfit Hazard (half injured, not just fat and lazy like the rest of the season) up front, the side needed to try to build up from the back. What resulted was embarrassing. Courtois’ time in Spain was clearly at the wrong club to develop that side of his game and Zouma, for all his potential and physical gifts, cannot pass the ball at all. So Chelsea had either Courtois hitting goalkicks long to Hazard, or trying to build-up to a comically low standard and one poor drop-pass that set Mata away for an opening said it all. Thankfully, Chelsea had less goalkicks as the game went on. I shudder to think what Pep Guardiola would do in charge of this side – he’d have to sign a new goalkeeper and a couple of passing central defenders. Trying to find positives is tough but a clean sheet is always welcome and Terry especially was excellent. To play that well at the age of 35 and with only one rest day, makes Benitez’s comments about him look very silly indeed. Mikel did decently in a rare start. His reactive style of play means he can come in after a long gap and usually deliver a solid display. Match fitness is less important for him than others. Zouma again displayed why he is perfect for certain physical examinations. 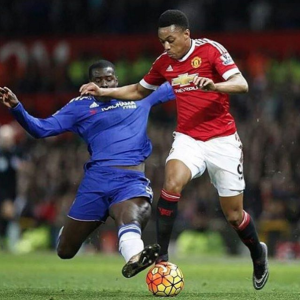 His outstanding pace and tackle on Martial showed his suitability to this opposition. Last season, Mourinho brought him in against Raheem Sterling (playing up-front for Liverpool) and Sergio Agüero, and this season we saw his effectiveness against Arsenal when Theo Walcott was used up front. I have serious reservations about his positioning and still think Cahill-Terry is the more reliable pairing with Zouma rotating in vs. certain opponents. Next season he may be closer to being first choice material. The workrate of Pedro and Oscar was typically impressive and although the former’s display did not impress everyone, I see him having a strong second half of the season. Oscar is a really important player when the side intend to press high but that was never going to be possible with Hazard up front. There were only a few examples all game of United being forced into a back-pass and then De Gea having to make an uncontrolled clearance. Costa-Oscar is undoubtedly the best front pairing just for their compatibility in terms of high pressing. Willian had perhaps his quietest game all season and by the 70-minute mark, Hazard was completely out of steam. With United changing two of their back four, it seemed an ideal chance to give Bertrand Traoré 10 minutes up front. He scored 17 times for Vitesse last season, with 13 of those when playing as a striker. Many of those goals came on the counter attack. Van Gaal’s side were better today than in previous weeks with Anthony Martial highly impressive. For an explosive player to perform that well just 48 hours after their last appearance is not something to be sniffed at. Defensively, they always looked susceptible in midfield with Hazard and Matic often carrying the ball significant distances straight through that area. The tactical fouls from Young, Herrera and Smalling showed the number of times Hazard got wrong side. Fair play to them. If the referee is not going to punish these fouls with immediate cards then it’s a great way to stop Chelsea. Man City have adopted ruthless fouling to stop counter attacking Chelsea setups in the past and it works. Maybe Chelsea should adopt some cynicism sadly lacking in the current squad. This was a a strangely negative approach by Guus Hiddink considering the low confidence and poor form of United. At least in the second half, the side defended slightly higher up the pitch and compressed the massive space between Matic and Mikel, and Oscar and Hazard. Had the side been fresher (or been freshened up more by the manager before/during the game) then maybe more ambition would have been shown. For large parts, this felt like a low quality Eredivise match.